When Barry Allen first ran onto Kid Flash sometime in 1959, the whole world of comic-dom screamed out in unison "Gee Whiz! What an amazing development!". But I wonder what they will say this time though? You know, in this adventure created by the super fast creative team of Brian Buccellato, and Francis Manapul; Published by DC Comics, in May, 2013. Using GENERAL terms, answer the following 4 questions about this SECOND PART of a STORY entitled 'In Reverse'. WHAT'S THE MAIN THRUST OF THIS TALE: To figure out if Kid Flash is the 'Speed Force Killer', The Flash has to run around the world, and stop the little sod in his tracks. ARE THE MAIN OBJECTIVES ACHIEVED: In a manner of speaking, yes, yes they are. Just not in a very conventional way though. ANYTHING ELSE HAPPEN: Iris and her brother, Daniel, have a heart to heart about their dear old pappy. HOW DOES THIS STORY END: With Patty going, OH! And with 'Sprint' going, ARGHHHHHH!! ... because I find this statement to be very true. Some kids nowadays aren't camera shy or cool. They just dive in and do whatever they want, come what may. Och! I'm starting sounding like an old git now. Oh, dear. (+) Now those of you who didn't get a buzz seeing the Flash and Kid Flash on the same page together, put your hands up? Go on. Make yourselves known. Oh! It's only that few. Fair enough. Scoot. Get off to bed without any supper. Naughty, naughty comic book fans you. (+) 'Two more to go' said the Reverse Flash after he killed what's-his-face. Boy! What a crafty little sh*t he is? Even though his appearance in this issue was a fleeting one, it was still very exciting to see him pop up right at the end of it. (+) From a personal perspective I did get a kick out of that conversation between Iris and her brother, Daniel. Well, is it just me, or is there something brewing in the West clan? Something to do with -- pray-pray -- our pal Wally, perhaps? (+) Wasn't it bloody intriguing to find out Kid Flash has absolutely nothing to do with the Speed Force! Wait a minute though. If he doesn't get his powers from that, where does he get his powers from? Hmmm. I'll pick this point up later in my conclusion methinks. (-) The majority of this issue was dedicated to Kid Flash outmanoeuvring the Flash, because for some strange reason he did not want to talk to him. OK. I know that this is a very conceptual view on things. Yet, for the life of me, I did not quite understand why Bart didn't want to speak to Barry! This point wasn't very clear within the overall narrative. Making most of it come across very 'disposable' as a premise to 'feed off'+ of. A CHEETAH AS THE FLASH: Come on. Let's face it. They're both very fast, right? So what else could I compare Barry to? A Pigeon? A PIGEON AS KID FLASH: No. Get that out of your head straight away. I didn't compare Bart with this animal because it was the first thing I thought of. What I did instead, is ask myself one very appropriate question -- what animal keeps on sh*tting on my balcony, and I can't get my hands on? See? 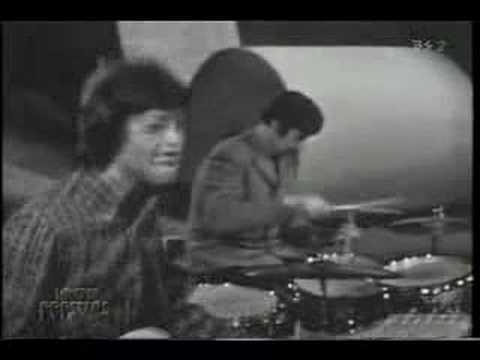 'KEEP ON RUNNING' BY THE SPENCER DAVIS GROUP: In my opinion I don't need to explain this one at all. Click on the video. And bask in its ironic glory. Ha! Wally West -- Because Dan Didididiidododod said he would not need them anymore, so he sold them to Bart at a discount price. Spinach -- Well, if it works for Popeye, why not Kid Flash? Eobard Thawne -- That's what everyone else is thinking, isn't it? Propane, And Propane Related Accessories -- Damn you 'King of the Hill'! China -- Why not? They make a lot of advanced stuff over there? Did you see that phone you can implant underneath your skin? Jay Garrick -- Yeah. That's right. I said Jay from 'Earth 2'. It could work, especially if that series is headed in the direction I think it's currently going. Max Mercury -- Ka-Pow! Wouldn't that be a right turn up for the books? Anyway, that's enough of my silliness for this month, folks. 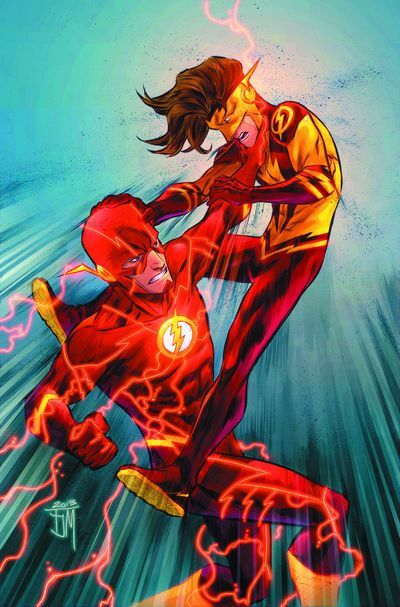 All I have left to say is that this issue of 'The Flash' was a fairly decent issue to read. The art was on point. The premise was engaging yet fleeting. And the only thing letting it down was that the overall narrative did come across like a 'stepping stone' story. Not having that kick in its step I hoped it would have had. Say No More.